Access to financial aid can be an important lifeline for many students, but it can also present challenges for the academic institution, as Diana Pino, Vice Chancellor for Student Services at Houston Community College (HCC) explains. “Financial Aid is probably one of the more complex areas within Student Services for any college or university,” she says, “and it isn’t just the rules and regulations surrounding the compliance component, it’s also the human aspect; you’re really managing money — your students’ money,” she adds. At Houston Community College, some 43 percent of students receive financial aid of some kind, and while ensuring them access to a quality education, the administration also wanted to provide their student body with greater purchasing convenience. With 70,000 students, dispersed over six campuses with twenty-two locations, students had the flexibility to use their student debit Eagle Cards for required study materials and supplies, but allocating those purchases to their financial aid accounts in a timely manner could be a challenge. What was required was a Student Financial Aid Solution, provided in real time. Such functionality would enable the college to identify purchases as they happened and offer the ability to check available balances and issue authorizations, or credits, against each student’s account in real time. Given the size and complexity of the Houston Community College system, it was key to the success of the project that the solution would provide precise, updated information across a variety of campus purchasing outlets, including purchases made online. “It was imperative that it enabled flawless communication between our centrally located financial aid processing, and the certainty that the information we were providing reflected the most accurate and up-to-the-minute status of a student’s funds,” Pino explains. She also notes that like many public institutions, the college didn’t have access to limitless resources and the project would require the close collaboration of both the HCC IT Department and Barnes & Noble College’s IT experts throughout the process. The resulting solution enabled the Barnes & Noble College system to communicate directly with HCC’s financial aid processing center, which manages aid entitlements, with real-time authorization requests that could then be checked against approved available funds. The system could then respond back to the store with an approval. “It really enables the college student to pay for their purchases with their Eagle Card account, either on campus or online, and enjoy the same kind of functionality they might expect with a bank card,” explains Rick Menees, Barnes & Noble College’s Director of Business Applications. “It required a custom approach to how we worked with the individual requirements of the customer, and also a high degree of testing. We wanted to ensure the integrity of the system — particularly during peak usage when everyone was purchasing their course materials at the same time,” he adds. Since it has been in place, the Real-Time Student Financial Aid Solution at Houston Community College has been a great success. 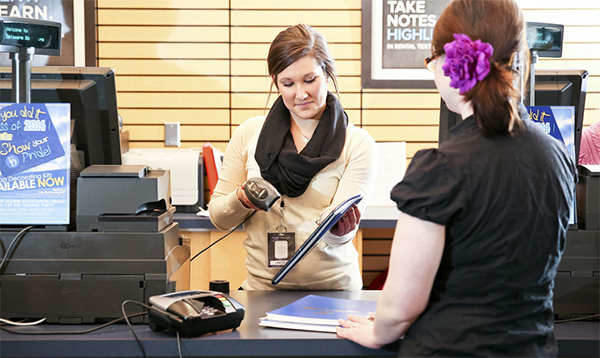 “From a service standpoint, it provides a seamless retail experience for the student, and from a billing and reconciliation standpoint, it’s much more responsive in providing updated information,” Eckhart says. One feature students may notice, and appreciate, is faster checkout times for their supplies. “There is no longer a requirement to have the customer wait while we check their available balance and have to post the sale into the financial aid system,” Menees points out. He also notes that the real-time solution doesn’t require any additional training for store staff. It retrieves the transaction and authorization information directly from the cash register without requiring segregation to any other system.